The application VeryPDF PDF to Excel Converter allows you to convert the document of pdf to excel file with different extension names: XLS or XLSX. It also supports to select the page range of the inputted PDF document if you want to convert several pages of PDF document to the Excel file. 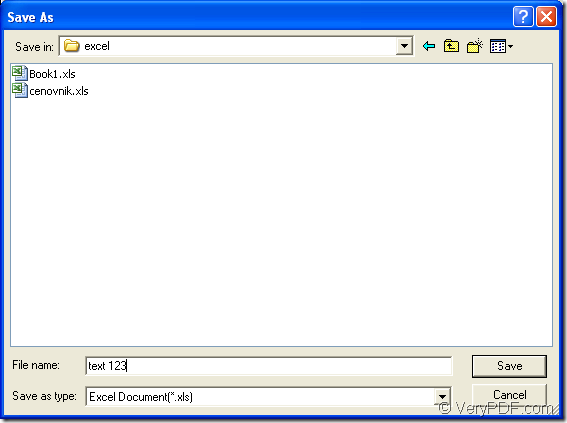 Before knowing how the application works, you need to download it at the following link: www.verypdf.com/dl.php?file=verypdf2excel.exe. This link is only for downloading the free trial version of PDF to Excel Converter. If you want to use the application without any limitations, you can buy it at its homepage: http://www.verypdf.com/pdf-to-excel/index.html where also provide different kinds of registration licenses for different users. When you install PDF to Excel Converter on your computer, you can create a desktop icon so that you can double click the icon to open the application when you want to use it, which is convenient. If not, you can open the application via clicking “Start”—“All Programs”—“VeryPDF PDF to Excel Converter v2.0”—“VeryPDF PDF to Excel Converter v2.0”. 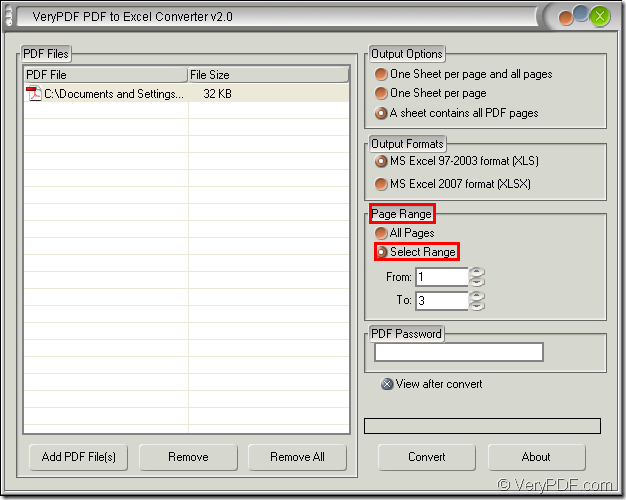 Then please see the following steps about converting pdf to excel and set the page range. Three steps will be enough. Firstly, please add the pdf document into the application. You can directly drag the file from its location and drop it into the file list of PDF to Excel Converter. Or you can click “Add File (s)” button below the list to open the dialog box where you can choose the PDF document to be used. Right clicking the file list and clicking “Add files” option in popup floating item can also open the same dialog box for choosing PDF document. 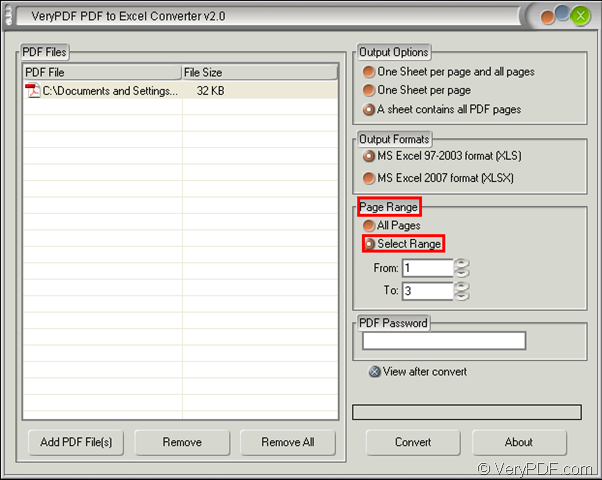 Secondly, you need to set the page range in the main interface of PDF to Excel Converter. Please see it in Figure 1. In “Output Options” group box, you can choose a suitable output layout for the target file. In “Output Formats” group box, please choose the format you like either “XLS” or “XLSX”. In “Page Range” group box, please check the option “Select Range” at first. When the boxes “From” and “To” become to be available, you can input the start and end page number page number according to your needs. If you have done all the operations above, please click “Convert” button to open “Save as” dialog box in which you can input the name and set the location for the target file. When clicking on “Save” button, the conversion from pdf to excel will start and you just need to wait for several seconds until the conversion comes to the end. Please see “Save as” dialog box in Figure 2. 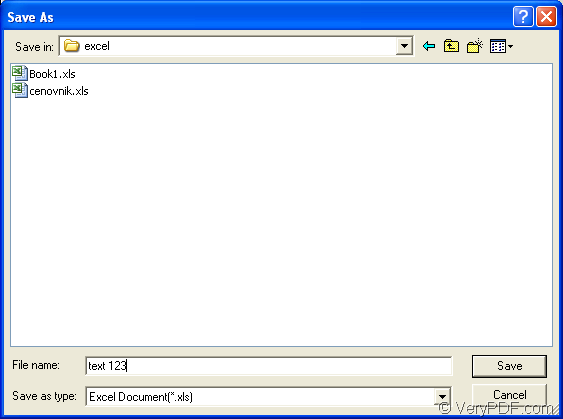 This entry was posted in PDF to Excel Converter and tagged page range, PDF to Excel. Bookmark the permalink.